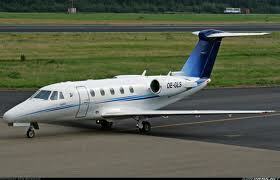 The Cessna Citation VII is part of the Citation III line with new avionics and more powerful and efficient engines. It is a recognizable aircraft by its low/swept wing and twin rear fuselage mounted engines. It has a swept T-tail with swept horizontal stabilizer. Each side of the fuselage has 6 cabin windows and carries up to 8 passengers with a 2 man crew. The Citation VII is a private jet that cruises at speeds up to 476 knots and has a range of 2180 nautical miles.